On Sunday, two women's snowboardcross riders crashed during the Olympic qualifying round for their event and had to be removed on stretchers. 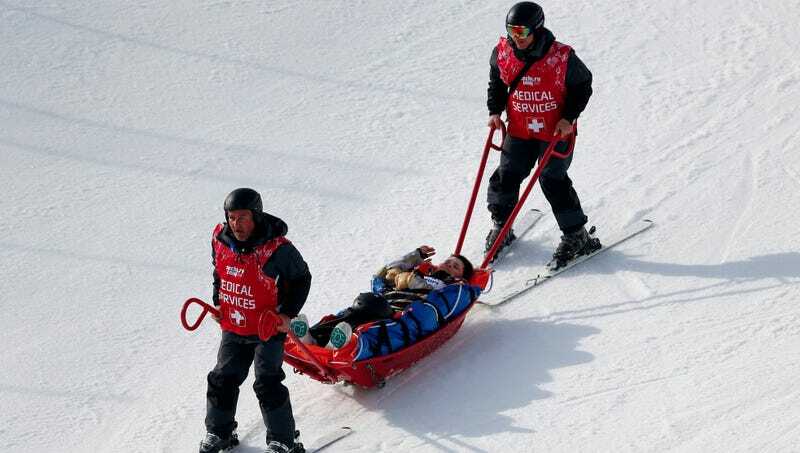 Even more dramatically, the day before, Russian skicross racer Maria Komissarova crashed at Rosa Khutor Extreme Park and had to undergo spinal surgery. These are just a few of the many crahses that have prompted some to wonder if women should be competing on different courses than men. The New York Times reports that, as of Monday night, 16 of the 22 injuries at Extreme Park that have prompted athletes to require medical attention (or even leave competition) have involved women. That's perhaps because the courses – which have already gotten a fair bit of attention for not being safe in general – have been designed with men in mind. The Olympics have a history — sexist, perhaps — of trying to protect women from the perils of some sports. But equality reigns at the Extreme Park, even to the possible detriment of the female participants. "When we practice, we don't practice on the same jumps as the men," said J. F. Cusson, ski slopestyle coach for Canada and a former X Games gold medalist. "They're too big for them. But when they compete, they have to jump on the same jumps, so they get hurt. It's a big concern of mine." It seems like consistency is a major issue here as well: why are the courses at the Olympics drastically different than ones the athletes are practicing at at home? Shifting how women compete in the Olympics to match the level they'd normally compete at is not same as the sexism that kept women's skijumping out of the Olympics. (That sport was originally vetoed partially because it was believed that women's bodies were affected more harshly by skijumping than men's.) But this is about acknowledging what levels people have trained at, what they're capable of because of that. While there's a larger argument to be made that perhaps women should or could be performing athletically at the same degree of difficulty as men in these and other sports, it's certainly not a good idea to have them doing so for the first time. Particularly in a park that has already caused so much unnecessary damage to all people, women and men.